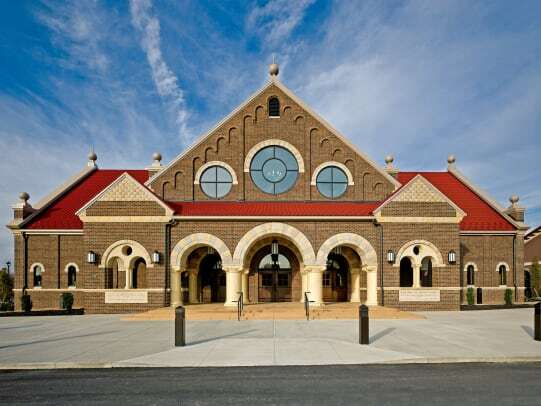 In 2005, St. Paul the Apostle parish in Westerville, OH raised $12 million to build a new 38,000-sq.ft. church. Established just over a century ago, St. Paul the Apostle parish in Westerville, OH, had outgrown two of its churches – a 1930s wood structure and a contemporary-styled stone church built in the 1960s. The parish is the sixth largest in Ohio and caters to 4,500 families. Every weekend, the church had held 12 masses for its 14,000 members and the existing 800-seat church just couldn&apos;t accommodate them, so services were held in the gymnasium as a result. In 2005, the congregation raised $12 million to build a new 38,000-sq.ft. church and an additional $3 million to construct a multi-purpose building and an addition to the existing school. 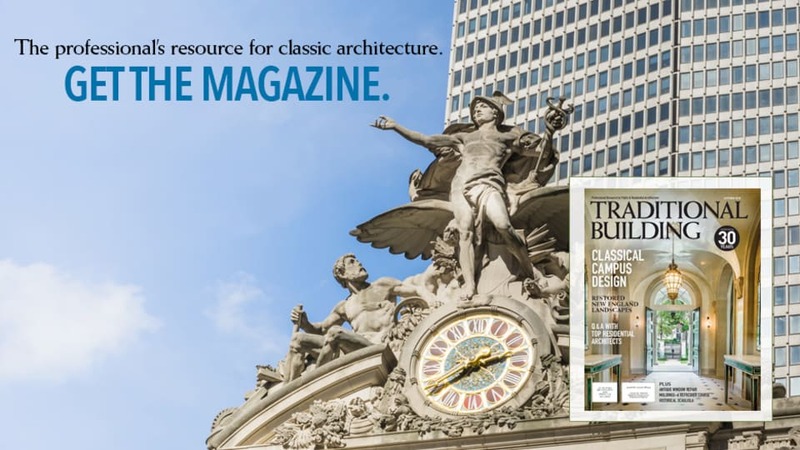 Meleca Architecture, Inc. of Columbus, OH, was hired to design the buildings in a traditional style. "The congregation wanted to build a church that could house the entire congregation to cut the number of masses in half," says principal David Meleca. "They wanted it to be very traditional to reflect the liturgy, which their existing church had not done. The first step was to design a master plan for the entire site; it included the location of the new church, the multi-purpose building, the school addition and parking accommodation." Over the years, Meleca Architecture has established a name for itself by utilizing a synthetic approach to design and build traditionally styled churches that fit the needs of modern-day congregations. For St. Paul the Apostle&apos;s new church building, Meleca looked toward regional architecture for inspiration. "In uptown Westerville, there&apos;s Midwest turn-of-the-century architecture and a few of those buildings have Romanesque Revival detailing," he says. "I picked up that vocabulary for two reasons; it was a fitting style and a fairly simple one to re-create. It&apos;s not high Gothic; it uses simpler forms and still results in that resonates. I also included some influences of Henry Hobson Richardson&apos;s work." Several of the inspiration buildings have and rusticated stone, which were both selected as primary materials for the exterior. Local brick manufactured by Canton, OH-based Belden Brick was used and a scallop design was built along the eave of the roofline on the main gables. Limestone imported from Jerusalem was used to create arches to the covered portico and window openings as well as a design feature for the two smaller gables on the main façade. The columns and capitals are fiberglass gypsum manufactured by Omaha, NE-based Plastrglas. They were painted to resemble stone by Johnstown, OH-based Integrity Design; the firm painted the interior as well. A 25-ft.-tall cross is atop the octagonal dome at the center of the traditional cruciform plan. Balls and finials, supplied by Tremonton, OH-based Munns Manufacturing, are on the to reinforce the symmetry. "Two of materials for this project were the and the material for the roof. Twelve containers of limestone were shipped from Jerusalem for the exterior and interior ," says . "The roof material is actually metal created to look like terra-cotta tile. It was changed during the construction process. We were originally going to use asphalt but were able to upgrade. The metal looks amazingly similar to terra cotta; the difference really is the weight. It&apos;s much lighter so we didn&apos;t have to beef up the structure." The roofing material was supplied by of New Kansas City, MO. A bell tower, positioned on axis with the main entry, is sited on the semi-circular Mary Shine garden across the drive of the front elevation. The copper cupola and the top portion were used on St. Paul&apos;s first church and were incorporated in a bell tower design for the second church, so the design team decided to reconfigure it for the third church. Inside, the narthex leads to the baptistery that features an infant baptismal font with a water feature that flows directly into the full-immersion basin below. Mosaic tile at the bottom of the basin depicts three fish and a wave design. Above, the choir loft houses the pipe organ and is enclosed with wrought-iron railings. The cruciform plan was not only selected to create a traditional layout but also to accommodate the congregation&apos;s request for a closer proximity to the altar. "If you look at the nave and the transepts, they are all about the same distance to the central space," says . "This arrangement allowed for a more traditional feel as opposed to having the pews [fabricated by New Holland, PA-based New Holland Church Furniture] auditorium-style around the altar. Visibility became an issue too. We raised the altar on a 3-ft.-high platform and the ambo up another two steps so these elements can be easily viewed from every angle." In lieu of a traditional apse behind the altar, the congregation requested a chapel area for private prayer. In response, the design team created a semicircular chapel with a half dome and surrounded it with columns topped with an entablature. The area is visible to anyone inside the church yet members can "enter" this chapel area outside of mass to pray privately. Another concern was how to create a warm and engaging atmosphere with so much wall space. Denis McNamara of the Liturgical Institute was consulted on developing the theme for the decorative interior. Evergreene Architectural Arts of New York, NY, painted the murals behind the altar and in the chapel area, which features gilding and American saints. The 3-ft.-dia. columns and capitals on the exterior were repeated within and faux-painted to resemble the Jerusalem limestone on the floor. 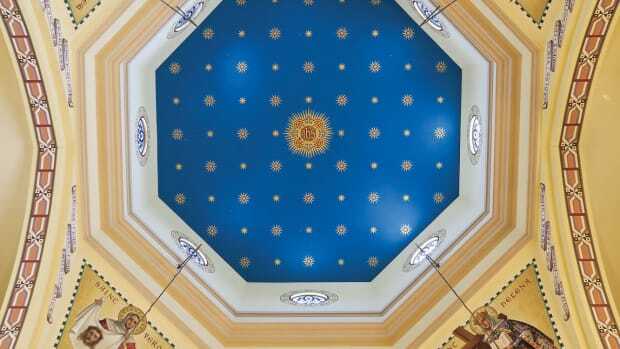 The ceiling is a dark blue to represent the sky with stars arranged to symbolize a perfected heaven. Ceiling beams are constructed of drywall but faux-painted to look like wood. 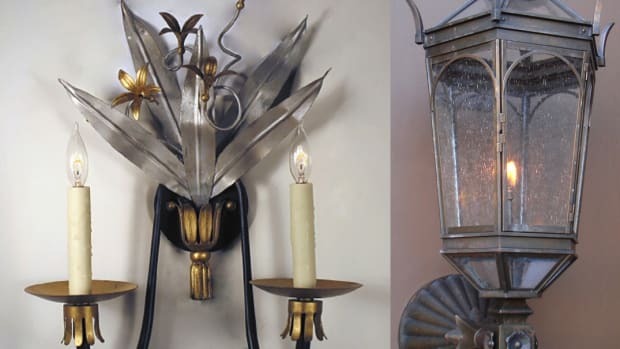 Custom-designed light fixtures by St. Louis, MO-based G Lighting complete the interior. The stained-glass windows, supplied by Brook Park, OH-based Henninger&apos;s, were salvaged from parishes closed by the Cleveland diocese in 2009. The church has 164 clear-glass windows that were manufactured by Charlotte, NC-based and stained glass panels will be added as donors step forward. So far, more than half of the stained glass has been installed. While the budget was quite impressive for a Catholic parish to raise through donations, it wasn&apos;t quite enough to build what they had in mind. Fortunately, the project was initiated at the start of the recession. When the initial contractor couldn&apos;t stay within budget, the congregation offered it to several contractors for competitive bidding. "The key to keeping within budget was to build the project in five phases," says . The first phase was to build the multi-purpose building, the school addition, followed by the new parking spaces and preparing the site for church construction, the building of the church itself and the last phase involved demolition of the existing 1960s church; all five phases occurred while the church continued to hold services. "This project was definitely a labor of love through years of hard work," says . "It got me through the recession so I feel very akin to it. Then to have people tell me how much they love this building and that they never thought churches could be built like this again was incredible. A couple of people told me it actually brought tears to their eyes when they walked in for the first time." 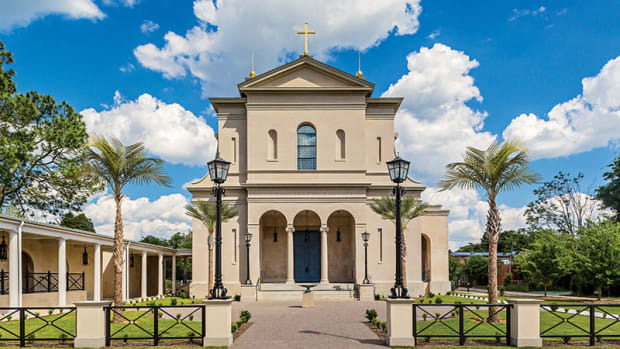 McCrery Architects designed a new traditional Roman Catholic Church for a historic congregation in South Carolina. 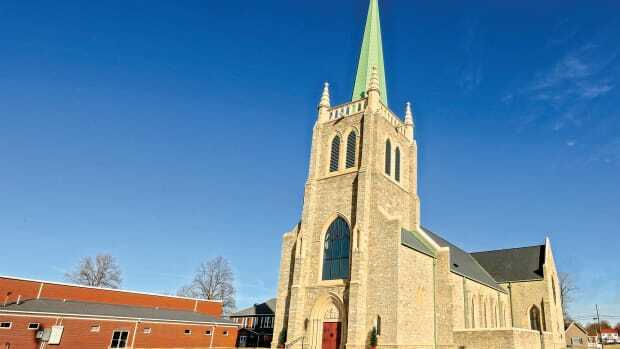 When a tornado destroyed St. Joseph Catholic Church in Ridgway, IL, four parishes combined to create St. Kateri Tekakwitha Catholic Church, and they turned to Cram and Ferguson to design the new building. Working with Clark Architects, McCrery Architects led the design for the new Saint Thomas Aquinas Catholic Church and Newman Center in Lincoln, NE.